Doctor Gábor Maté is someone I’ve admired from afar for a long time, without really knowing more than a few superficial details. He’s known for the sort of beliefs that go beyond mere image management, an advocate and activist who takes risks. Maté took on the conservative elements of the government (and to be fair, that would likely be true whichever party were in power) in his role with harm-reduction activities in the Vancouver area, helping drug addicts. If there is a single word I associate with Maté it’s “compassion”. In his books, his columns, in his public advocacy, he speaks of addiction and its relationship to health and disease, abuse and pain. Where the law enforcement culture obeys a paradigm where drugs = crime to be punished (and the police–who perhaps also deserve sympathy, follow the orders of their political masters and shouldn’t be blamed for ruinous policies created by people in Ottawa or Washington, far from the battle-ground and with no real understanding of the people involved) , and addicts = criminals to be locked away, Maté is part of a very different movement, one that attempts to understand the root causes of addiction, beginning with the assumption of personhood rather than blame: in other words, compassion. You can hear his TED talk to get a better idea. Speaking of pain, Maté’s own life suggests that this isn’t merely an academic exercise, but wisdom acquired the hard way. He is a child of the European Holocaust (for example some family members were murdered in Auschwitz, and his father endured forced labour) born in 1944 in Hungary, whose family then emigrated after the 1956 uprising. Maté has been a doctor for decades, in the foreground of helping people, now mostly as a writer and an activist seeking to change the way we think. He’s now going on stage in a play that creates a new platform for his ideas & research. The Damage is Done: A True Story combines theatre, dialogue, essay, video, music and dance into a multi-layered event. Featuring Dr. Gabor Maté onstage with Rita Bozi, the show weaves together the story of three different Gabors, all of whom emigrated from Hungary to Canada and shaped Bozi’s life. The audience is taken on a journey from the invasion of the Nazis to a failed Revolution, from The National Ballet School to Canadian punk rocker BB Gabor, exploring the impact of historical trauma on its performers and on the characters they play. Gabor playing himself, and Bozi playing a multitude of characters, explore the cultural history and family dynamics that resulted in their experiences of depression, addiction and thoughts of suicide. The performance reveals how the impact continues to haunt them today. Healing, they find, comes from the ability to look at traumatic events from infancy and early childhood with humour and compassion, and to defuse the emotional charge that first arose in response to those events. Infused throughout the performance are Gabor’s challenging insights as evident in his writing and workshops. ”Understanding that even though the damage is done, we can defuse its impact, is crucial to healing,” Maté says in the final moments of the play. This is a 90 minute no intermission performance, followed by an audience-participation discussion. The Damage is Done will be presented October 15th at the Banff Centre, then October 20-24 in Vancouver. I was fortunate to get Dr Maté to answer 10 questions, to get some idea about the man and his current work in The Damage is Done. he had a broad interest in the world, in history, in culture. He was also quite open in his opinions—both in expressing them, and also in a willingness to drop them when new information came along. What neither of my parents had—this task fell to me—was a drive for self-knowledge. I am compelled to mention here my maternal grandfather, Dr. Joseph Lővi, who perished in Auschwitz when I was five months of age. He was a hidden influence all my life. He was—could this possibly be a coincidence—a physician, writer, and political activist. What I most like is to witness the transformation my work helps to induce or support in people, whether through my writing or through personal interaction. My ego, of course, likes the recognition. But what my ego likes and what gives me joy are not at all the same thing. Donald Trump says that “show me a person without an ego, and I’ll show you a loser.” He has it exactly backwards, in line with the ego’s take on reality. Beethoven string quartets. He wrote sixteen and I have at least seven complete versions. Each is different every time I hear it. “He who divines the secret of my music is delivered from the misery that haunts the world,” the composer said. It’s true, in a relative sense. Not even Beethoven can deliver anyone else from misery, not even the Buddha or Jesus can—that possibility is for each of us to achieve for ourselves–but they can all point to liberation. In the musical realm Beethoven gets me there, transcending mundane reality. Being a great drummer. Or any kind of drummer. But, at least, I’ve always marched to the beat of my own drum. Reading, music, bicycling, swimming, gazing into my wife’s loving eyes. 1-Please tell us the history of The Damage is Done and how you came to be involved. Rita Bozi, the therapist/writer/dancer—a fellow Hungarian–who created the play was influenced or affected by my writings and speakings and, at some point, somehow wrote me into the production. So there I was and here I am, impersonating myself. Rita plays and dances herself and everyone else. Fellow performer, stage crew, sound people, lighting designer, etc. Difficult at times, since I don’t get to dictate the terms. Again, the ego does not like that. And the more difficult, the more illuminating. Whatever I write, my books are not only about me, in part, but always for me. We teach what we have to learn. I’ve been deeply challenged throughout my life with the early childhood imprints of trauma, shame, depression and hopelessness. The work of transformation is to recognize the illusory nature not of suffering, but of the self-created dynamics that lead to suffering. The Damage Is Done is a staged embodiment of how historical trauma (Hungarian history, in this case) can severely affect a single family and express itself in the suffering of generation after generation. Ultimately liberation lies in the transcendence of history. 3- The title “The Damage is Done” is a very fatalistic expression. While I suspect the ultimate answer to this question lies in your presentation, please talk about the different ways one can understand this phrase. I agree, and I argued against this version of the title. It implies that the damage is irrevocably fixed. That certainly does not need to be the case, and is not the case in this play. The Damage Done, I thought, would have been a more accurate title, because it would have left open the possibility of healing—which really is the message of this production. But I’m only a hired hand, playing myself. I don’t get to dictate the terms, as I said above. Well, that’s not true either. More true is that this is a debate in which my views did not prevail. 4-From what I know of your work, you are a healer. In The Damage is Done how do you reconcile the desire to, on the one hand, create (art or entertainment) and your genuine impulse to heal? Why can’t healing be entertaining? If we succeed, the audience will both be engrossed in and entertained by our depiction of human life and experience for themselves the possibility of healing inherent in human existence. 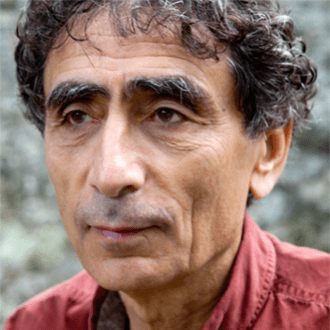 “If we don’t despair of life, healing is possible,” says Gabor Maté in this show. In the show I acknowledge two of my great teachers: Eckhart Tolle and A.H. Almaas. They have been the most directly influential mentors in my life, a life I would not wish to imagine without the wisdom they manifest. Doctor Gábor Maté will be speaking twice in the Toronto area September 27th, and in London Ontario Sept 28th. The Damage is Done will be presented October 15th in Banff where it was workshopped earlier this year, then in Vancouver Oct 20-24. For further information on any of these appearances, or to see if he’s coming to your town (several in the USA as well as closer to home in Western Canada), see his events listing for further details. This entry was posted in Interviews, Politics, Psychology and perception, Theatre & musicals and tagged Gabor Mate, Rita Bozi. Bookmark the permalink. I’m sorry I can’t help. I interviewed him in 2015. But perhaps you should try making contact either through his website or at one of his events. He is very approachable in my experience. I was raised in a very remote community as a child, until I was about 16 years old. I had little outside or world view influence. I had multiple adults who helped raise me and community influenced each other. I believe the mind and body, life on the land & the land still speaks are essential to relationship. I feel isolation is in part a factor in Resiliency and even more so the wisdom of the elders that is passed down.